Boston, MA, then New York, NY. Publisher: F.J. Needham. Editor: Prentice Mulford. The journal's monthly essays were bound in annual volumes and sold by the publisher, F.J. Needham, as Your Forces and How to Use Themi>, and in that form they became one of the cornerstones of New Thought, centered on the refrain "Thoughts are Things." The bound volumes recite that the essays were "by" Mulford (1834-1891) while the individual issues more modestly state that they were "edited by" him, a difference that reflects the debatable origin of Mulford's teachings. 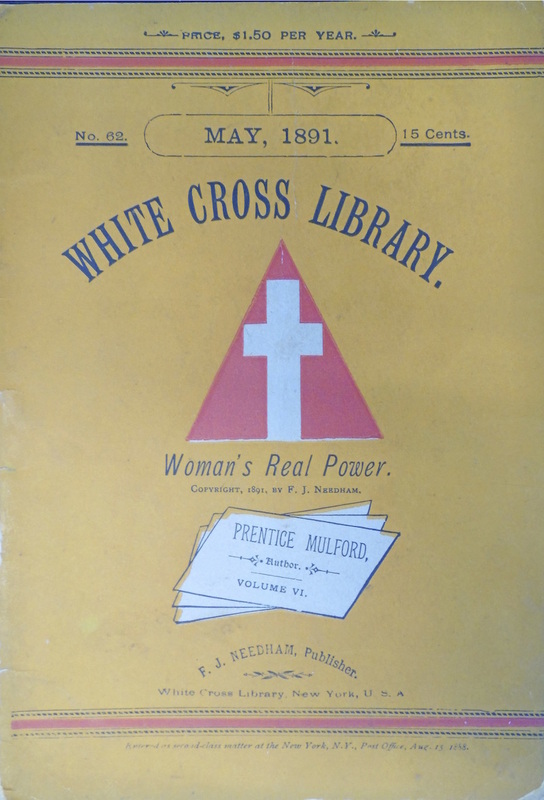 After he was found dead in his boat (appropriately named "The White Cross") off Long Island in June 1891, Susan Willis Fletcher, the old spiritualist who had spent a year in jail in England for fraud and had a long and unsavory reputation as a medium, came forward with the story that she had formed the "White Cross Society" in England in 1879 to explore the deeper aspects of spiritualism. On returning to the United States after her imprisonment, she claimed that she had reconstituted the society in Boston at the beginning of 1885 with herself (and perhaps others) as the medium for revelations--the essays published in this journal--and with Mulford as amanuensis and recorder. 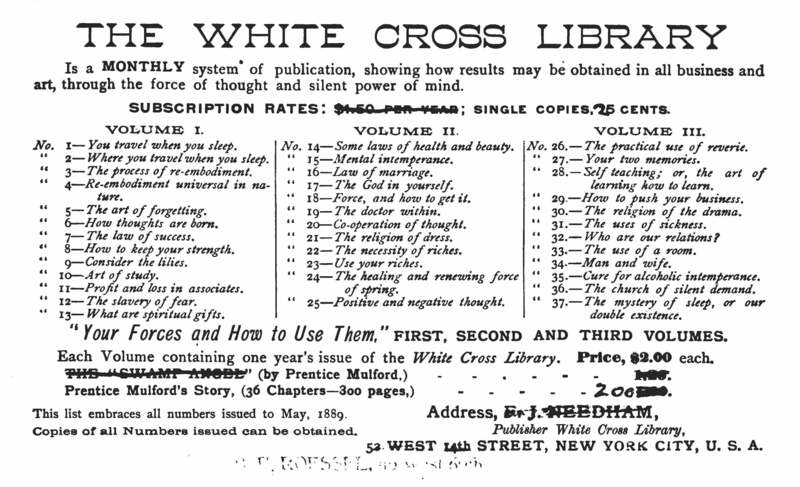 Mulford did know Fletcher and wrote in Spiritual Offering in January 1885 a report on one of her seances in Boston, but never mentions her in the journal or explains why it was called the White Cross Library. The standard version of events, supported by the journal and promulgated after his death by his publisher, was that he had begun writing the essays c. 1884, before going to Boston, and was their author. The first issue contained Mulford's "You Travel When You Sleep" which brought to the fore in New Thought the concept of the spirit of man as a subsisting entity, free of the body--with all that concept implied. No. 62, "Woman's Real Power," is a carefully crafted explanation of the importance of male and female energy in psychic and spiritual development. LOC; NYPL; Skidmore, Lily Dale (May 1891). The majority of the material was republished -- often more than once -- in volume form, from the stereotyped plates of the original serial issues.